Remember when Howard Dean was going to suspend his campaign for president? You know, no more campaigning, no more staff, no more press releases, no more interviews, no more trying to get people (aside from the good people of Vermont, who couldn’t help themselves) to vote for him? That was a big deal. On the other hand, you could be forgiven for wondering, given that John McCain is still sending his Vice President and his surrogates out to rally the faithful, still has TV ads airing (and they’ll all be back on Saturday), is still out spewing his own campaign talking points while his campaign still blasts Barack Obama, and still took the time to address (the painstakingly gracious and bi-partisan) Bill Clinton’s group while other US Senators were trying to make a deal, just what the big deal was when he announced he was suspending his campaign. But we shouldn’t understate the significance of John McCain’s sacrifice: if he actually votes on bailout legislation, it’ll be his first Senate vote in six months! (That makes McCain the Number One Absentee Senator, ahead of Tim Johnson, who was recovering from brain hemorrhage). 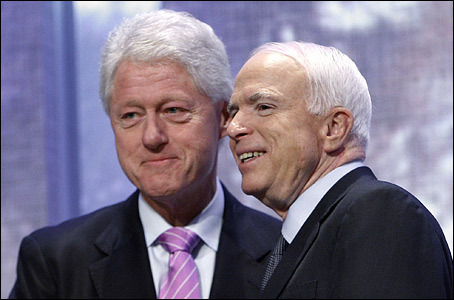 So if McCain’s campaign sees it is a world-historical event when he considers his first (potential) Senate vote since he was traipsing around on a largely ignored biographical tour and trying to take advantage of Hillary Clinton’s news hooks, who can blame them? This entry was tagged Barack Obama, GOP, Hillary Clinton, Howard Dean, John McCain, Senate, Tim Johnson. Bookmark the permalink.